I'm mot a noob cook, but it's the first time I'm buying myself a proper kitchenware. I have a hard time deciding which frying pan would be the best form me. In fact I'm pretty much set on buying 2 pans, as it seems there is no one pan that cover all the situations. I cook pretty lot of italian food. I don't do meat too often (and I plan stopping eating it at all very soon), rather many vegetable/flour dishes. Usually I cook for myself (sometimes for 2), but often do big portions of the dish that will last me for 2-3 days. Of course sometimes I fry myself an egg or just need to fry some onion for some other dish. I want a solid and versatile solution. I can and am willing to take care for it, so I don't mind if it needs seasonig or cannot be cleaned with soap. Though I don't want to pay only for a brand name, budget is not that big of a problem, as I think it'll be a profitable investition. After doing pretty extensive reading on my own it seems stainless steel, regular (non-enameled) cast-iron and enameled cast-iron are the most commonly advised. I'm pretty much set on that one of the pans I'll be buying will be cast iron, as it's said to be very solid and good for everything other than acids. Which one do you think would make a better addition to a cast-iron pan: stainless steel or enameled cast-iron? If stainless steel, then pure steel or one with non-stick/copper coating? What sized do you think would be the best? I'm thinking about 26cm (10 inches) diameter. Should I go for a slightly bigger 28cm? I have even bigger problem with the depth. Should I buy a shallow frying pan (like this one: http://www.skeppshult.com/en/sortiment/professional/frying-pans/0260-2/) or deep pan (like this: http://www.skeppshult.com/en/sortiment/professional/deep-pans/deep-pan-25-cm/)? Do you think a lid for the pan is a must-have? What are the best materials for handles? Many manufacturers do wooden handles, but I doubt it being a good solution, as you cannot put a pan in the oven then. Are steel handles okay? What brands would you recommend? (I'm living in Poland, so no US-only brands please) I heard Skeepshult makes very good cast-iron, but I also read that it's not use in buying expensive brand cast iron pan, as the cheaper solutions aren't any worse. For enameled cast iron people recommended Chasseur and Le Creuset (this one also makes stainless steel pans). What would you recommend for stainless steel? If I could only have two pans, those pans would be a high quality 12 inch stainless steel skillet, and an enameled cast-iron Dutch oven. Both pans would have a lid. Tempered glass lids are nice on the skillet/fry pan, but the quality of the skillet is more important. Dutch ovens come in a huge range of sizes. Consider the size you want carefully, this pan should outlive you. Are you likely to be cooking for a larger number of people at some point in time? 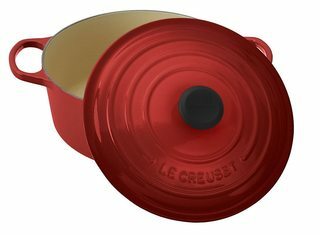 For someone to whom both are available, there is no way I would recommend paying $300 or more for the Le Creuset brand, when Lodge makes virtually the same pan for $60. I'll have some more info for you in a bit (note: we later discussed it at length in chat), but I probably won't recommend a specific brand unless I happen to find a credible source for such a recommendation. Welcome! I'm going to start by saying that you may get many different answers as a lot of information will be based on personal experience. Glad to read that you are going to choose cast iron for one of your pans. If I were going to add one more pan, I would choose enameled cast iron over stainless. I personally find it to be much more versatile and it heats up quicker and more evenly than stainless. I have two sets of SS cookware and many enameled cast iron pans. Without fail I will grab an enamel pan first. Regarding size, I would go larger and deeper. This will give you more versatility than a smaller or more shallow pan. You can put less in a larger pan (and sometimes this is a really good thing) but you can only put so much in a smaller pan. As for a lid, I do like glass lids, but don't think it's a must have. The important thing is to have a lid that fits properly. I checked and they do ship to Poland, and ironically, it looks like the founder is of Polish descent, though born in Ohio, US. I seriously love this pan. I always get a pan with metal handles, wood breaks down and I like my pans to be able to go from stove top to oven. Although some of the black handles claim to go in oven, I hate risking it. I do use it nearly daily. I don't have any trouble with sticking, and sometimes the "sticking" is necessary to creating a nice crust or brown on foods, also critical to the best sauces or gravies. Wish I'd had one of these pans years ago. A lid is critical for me to keep food warm, moist, or to melt cheese, keep spatters down, etc. I don't usually end up using the lid in the oven as I'm often baking or roasting. I still have my cast iron pans, but don't use them often anymore, mainly because they're 10" and care can be challenging, I cook with lots of tomatoes which is bad on cast iron. After getting married I started using toxic Teflon again b/c my MIL used it and it is handy, but after learning of how very toxic it was, switched back to my stainless steel. If I had to have one pan, it would be this one--it's a skillet, a casserole, etc. I love having 2 handles, I love not having the long handle sticking out, it stores/stacks better, cleans up great. I suppose you could put in d/w, but I hand wash this pan, as I do all my pans and loved items, and I use Barkeepers Friends scouring on occasion, but not necessary. After 10 years, it's still shiny and nice. If I could try another pan, I would go for an enameled cast iron. I'm very happy with my 12" Calphalon everyday pan, and size is perfect for family of four. Not the answer you're looking for? Browse other questions tagged equipment pan frying-pan or ask your own question. Cast iron, forged iron or carbon steel pan for induction? What do I have to worry about when using a stainless steel pan as opposed to nonstick?